César Augusto Aquino de Castro is a young famed personality from Brazil. He is a Brazilian competitive diver who has represented his country in the Olympics for several consecutive years and given wondrous performances also. He was born on September 2, 1982, in Brasília, Federal District of Brazil. On the other, he has won several championships which isreally a matter of proud for both him and his country. He possesses a great passion for his work which has motivated him to make an Olympic tattoo on his back near the shoulder. 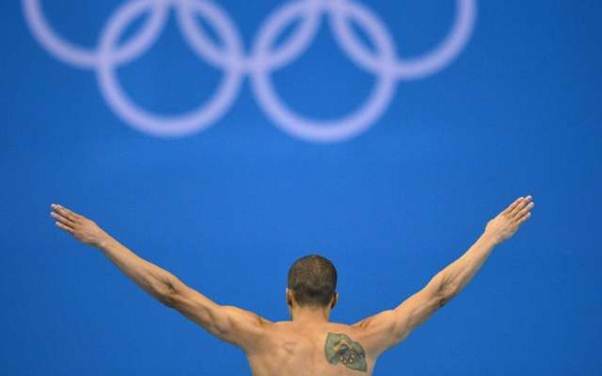 These sorts of tattoos have already done by many other famed people from that ground and César Castro is also one of them who has pasted five rings of Olympics with some other ornamental design on his attractive physique. Olympic rings represent five continents which take part in the Olympic game every year. Naturally, this bears a great significance and that’s why players take an interest in pasting these rings on their bodies. Thus, in the case of César Castro also Olympic tattoo gets much value and it increases the bold quotient when he arrives with the bare body.